YIMBY groups are benefitting from the negative perception of the term NIMBY, but also because of their unified cause. While the NIMBY term is well-known, the tricky part about organizing a national NIMBY coalition is that intentions behind NIMBY groups might vary city-to-city—one group might be fighting against subway expansion, another against tall buildings, for example. YIMBY organizations, on the other hand, have quickly united around the singular issue of more housing—and an explosion of national media coverage highlighting their shared mission. YIMBY groups have also managed to harness the power of social media, using Twitter and Instagram to spread their message while the messages of NIMBY groups are still a bit clunky. 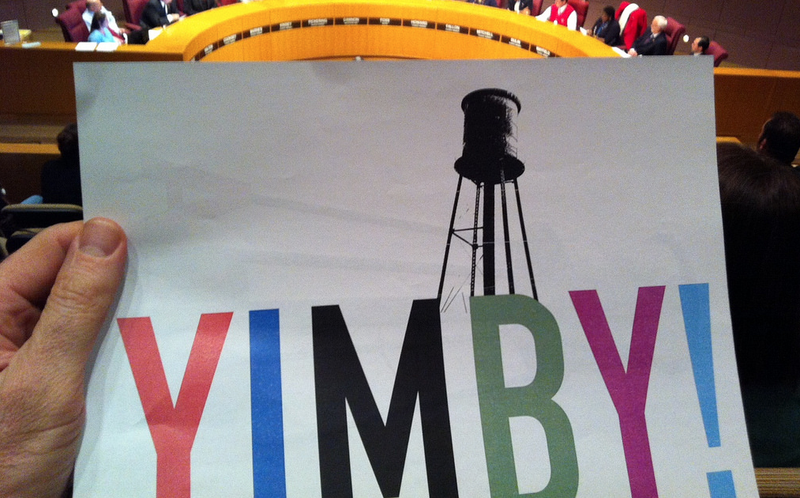 The creator of @NewYorkYimby, Nikolai Fedak, who has long been a vocal advocate for development, recently launched the Yimby Forums, a kind of Reddit for YIMBYs, which allow people in any city to discuss pro-growth strategies in their neighborhoods or comment on specific new projects. But the greatest evidence that a national movement is taking hold is what’s being called the first national YIMBY conference, which is happening in Boulder, Colorado, in June of this year. According to conference materials, attendees hope to “create connections to help move housing policy and sustainable urban infill and redevelopment.” @SFyimby and @SEAyimby will be there, of course.